This is a chronological succession of prophets which is narrated through reference to location (see Fig. 8). This prophesy is reported at the end of Deuteronomy in association with the story of the death of prophet Moses (pbuh). It was a blessing and glad tidings bestowed by prophet Moses upon his followers just prior to his death. It was designed to give his followers hope upon the occasion of the passing of their prophet that God is not abandoning them, rather, the best is yet to come, and He shall continue to bless mankind with His guidance and His light. Seir is a reference to Jesus (pbuh). It is usually associated with the chain of mountains West and South of the Dead Sea extending through Jerusalem, and Bethlehem, the birthplace of Jesus (pbuh). It was later extended to include the mountains on the East side as well (Dictionary of the Bible, John L. McKenzie, S.J., p. 783). However, Seir is also identified with the Northern border of the tribal territory of Judah and usually with Saris near Kesla (Chesalon), barely nine miles West of these two cities (The Eerdmans Bible Dictionary, by Allen C. Myers, pp. 921-922, and The Interpreter's Dictionary of the Bible, V4, p. 262) Prophet Moses (pbuh) never in his lifetime entered Palestine, and thus, this could not be a reference to him. As we have already seen in section 6.4, Paran is a reference to the city of Makkah in the Arabian Peninsula. The wilderness of Paran is where Abraham's wife Hagar and his eldest son Ishmael settled (Genesis 21:21) in the Arabian desert, specifically, Makkah. Makkah is, of course, the capital of Islam in Arabia and the birthplace of Mohammed (pbuh). Mount Paran is the chain of mountains in that same region which the Arabs call the "Sarawat mountains". 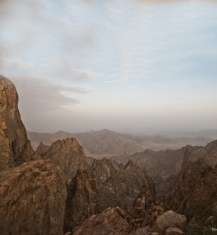 Muhammad (pbuh) received his first revelation in the cave of "Hira'a" located in these mountains (see Fig. 9). Jesus never in his life traveled to Paran. Mohammed, however, was born there. He became the prophet of Islam there. And it was the capital of the Islamic religion in that day and this. No prophet of the Bible ever came from the Arabian city of Paran (Makkah). Prophet Muhammad (pbuh) is the only prophet of God who has ever fulfilled this prophesy. We also read in verse 33:2 that a fiery law shall issue forth from the right hand of the prophet from Paran. Muhammad (pbuh) did indeed come with a new law called the Shari'ah. The reference to "right" hand is a reference to strength, justice, and guidance. "Biblical phrases referring to the right hand reflect a widespread human cultural attitude, namely the recognition that for most people the right hand is both stronger and more adept than the left, and is the hand with which many tasks are instinctively undertaken ... Eccl. 10:2 links 'a wise man's heart' with his right hand, and 'a fool's heart' with his left. When the Son of Man separates the sheep from the goats at the Last Judgment, it is to the damned 'on the left hand' that he says, 'Depart from me, ye cursed, into everlasting fire' (Matt. 25:41) ...The right hand is often mentioned as a symbol of strength, both for human beings and anthropomophically for God (e.g. Job 40:14; Isa. 48:13)"
This fiery law that shall issue from the right hand of the prophet from Paran will be a new law for the children of Israel and not the same one they had been practicing in the time of Moses (pbuh) and later. This is held out by simple logic; if I already own something, then I can not say that my neighbor shall bring "for me" this same "something" which I already own. In such a case, he would have "brought" nothing and it would have been more logical to say he would "confirm" the preexistent law. No prophet of the Bible ever in his lifetime either came from Paran or preached the replacement of the law of Moses (pbuh). Even Jesus (pbuh) came to confirm and reinforce the law of Moses (Matthew 5:17-19), as explained in detail in chapter one. Muhammad (pbuh) is the only prophet of God who fulfilled both of these requirements. However, if we look closely, we will find that the prophesy contains one more requirement. It tells us that this prophet from Paran who will bring a fiery new law shall come with 10,000 saints. Once again, two years before the death of prophet Muhammad (pbuh), in the year 630 AD, he lead 10,000 of his followers to their final and decisive victory against the pagans of Makkah (see chapter 10). This was one of the most bloodless victories of all history. The Muslims took control of Makkah, the capital of paganistic Arabia, virtually without a single casualty. Upon entering Makkah victorious, Muhammad did not take it's inhabitants as prisoners. Even though these people had been torturing himself and his companions, and killing many of them over many years, still, Muhammad commanded that they not be tortured, nor should retribution be sought against them. Rather, he pardoned them all and set them free. Most of them entered into Islam.